Earlier this year, the Malaysian Government’s Department of Wildlife and National Parks (DWNP) released a heartwarming video featuring a wild Malayan tiger playing with her rambunctious 5-month-old cub. To most of us, images of a springy cub pouncing on mom are downright adorable, but to conservationists, seeing a vigorous tiger family tells a more important story. The health of mother and cub tells biologists there is sufficient prey for successful reproduction. Locating and protecting adult tigers is only the first conservation step—ensuring that they can raise cubs is the key to a bright tiger future. If you have been following our Tiger Team updates, you already know Malayan tigers face serious threats to survival, specifically from wildlife poaching and widespread habitat loss. In some communities, tiger pelts are considered symbols of wealth and tiger body parts are believed to be a medical cure-all. And right now, thousands of acres of tropical forest are being chopped down for palm oil and other types of agriculture, essentially stripping tigers and their prey of essential habitat. Now, another challenge is emerging for tigers: finding enough food to survive. Malayan tigers feed on diverse prey in the forest, but one of their favorite meals is sambar, a large deer with impressive antlers, found over much of Asia. 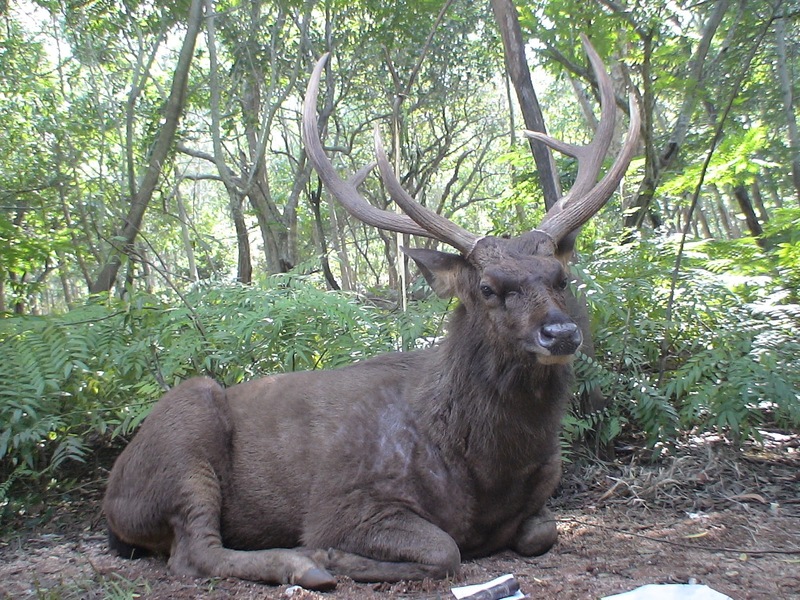 Currently, Asian sambar are listed as vulnerable on the IUCN Red List, but tiger conservationists are arguing to relist them as endangered in some regions where they are quickly disappearing. For example, in Peninsular Malaysia where we work to save tigers, sambar populations are greatly suffering from overhunting and commercial poaching—the meat is sold as a delicacy to restaurants and urban consumers. 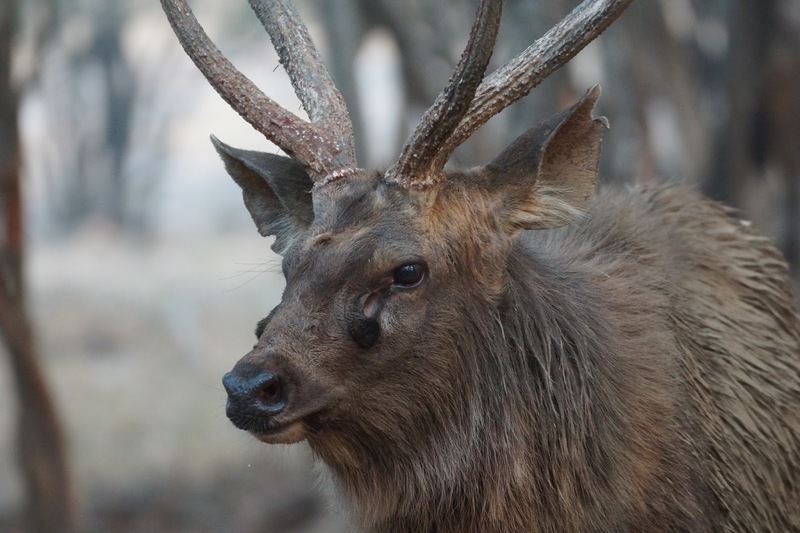 The sambar’s antlers and other body parts are made into trophies and household décor. DWNP is responsible for managing game animal populations, and has taken steps to protect sambar deer by imposing a long-term moratorium on hunting. Yet poachers continue to break the law and kill too many sambar. Sambar and tigers are intrinsically connected. Drastically falling sambar populations deprive tigers of one of their larger prey items, and cause them to be less efficient predators. This is especially challenging for lactating female tigers with smaller home ranges trying to keep their cubs nourished. Back to the video. The images are a series of photos recorded by a camera placed in the Taman Negara National Park, where DWNP, Woodland Park Zoo, Rimba, Panthera, and our partners are studying and protecting Malayan tigers from poachers. We can see that both animals appear healthy and well-nourished, and in the case of the cub, overflowing with energy. Adorable, yes, but the most important takeaway from this video is this: a strong tiger cub indicates large prey like sambar is present. Evidence of a healthy tiger cub also reveals why Woodland Park Zoo and our local on-the-ground partners collaborate with DWNP to strengthen anti-poaching efforts for tigers and all protected prey species. And because a sustainable sambar population is critical to tiger recovery, we are also tracking numbers of sambar in our study areas. These combined efforts, and similar prey protection efforts by other conservationists around the world, can help bring sambar numbers back up. Good for sambar and good for tigers. Deepen your commitment to tigers! Help us continue our work with DWNP and our partners on sambar protection. Make a gift of any amount online and specify “tiger project” in the "Notes/Indicate designation or pledge payment" field.